It's been a busy several days here at the Cabiria Studio! Part of compiling images for a combination of uses - investor packages, potential line sheets, sussing out details for the samplemakers, etc. - is the actual DESIGN of the clothes. What fabrics work with what designs? As a small company dealing with limited yardage runs, I don't simply design the clothes, pick a fabric, and then cut and sew x number of them in that fabric. I've got 65 yards here, 206 yards there, 9 yards somewhere else of different fabrics. Which creates EXCLUSIVITY! 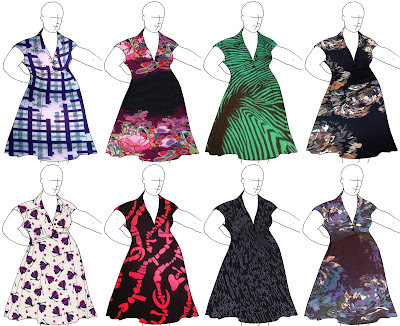 That dress in the green zebra print silk jersey? Only 14 yards of it in existence. Which means there's very few of those cut. The dress in the crazy Peter Max Goes to Hawaii cotton sateen? Just around 100 yards of that in house. Sounds like a lot, but really in Plus Size land, it's more like 28 - 35 dresses. Boutique limited production runs in practice! So let me introduce you to some of the possibilities. 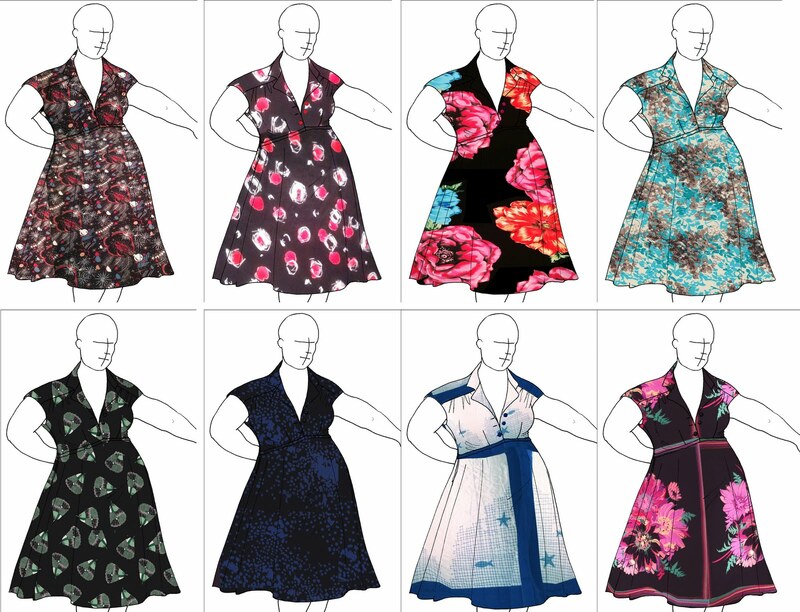 Each dress is a specific style (in this case, the "SOFIA") shown with what it would look like in a number of different fabrics. Let me know your opinions, please! (But try to be civil. If you're going to be specific, or your comments are long, email me personally at eden@cabiriastyle.com, please.) Nothing helps me develop as a business more than knowing what my potential clients want. This dress is featured in both woven and knit, has a slightly elasticized waist, a 3 button placket, and reaches just below the knee in a generous A-line. Also please note I'm not a graphic artist or Photoshop wizard, so the underlay of the fabrics for each dress might not be perfect, but it's pretty close. Don't judge my Photoshop skills, please! From Top to Bottom, left to right- I would buy: Row 2, box 2- love love love love. If I were shopping and feeling like I was hot to trot, I would buy Row 4, box 2. Oh, and Row 3, box 2 as well. Ok, so fine, I have three favorites. @Meredith sweet! So in terms of yardage availability, the Row 2, Box 2 option has plenty of yardage. The other two will probably be unique dress cuts, or at most, 2 dresses only. This is partially why if stores order more, I can have yardage printed custom, but I have to meet print minimums first. Nice! Thank you! Love the styles from demure to bold! All beautiful! Would wear Row 4 Box 3 endlessly (especially if it has pockets) and Row 4 Box 2 if I were less shy (and if they were my size). What is the brown part on the skirt of Row 3 Box 3 (green zebra)? @Chia - you're awesome! okay, so to clarify, they're ALL THE SAME DRESS. Just want to make sure everyone realizes that. The dress does have pockets - all my dresses do, whenever possible without making draping problems on the body. The black swoopy part on the green zebra is part of the pattern. It's taken from some real zebra pattern, I'm pretty sure, but the black swoop is strongly represented. And the Row 4 Box 3 is silk charmeuse with stars and lightning bolts! Good call! Favourites: Row 1 Number 3; Row 2 Number 4; Row 3 Number 4. Also loved fabric in Row 3 Number 2, but not sure about black in the centre. Row 3, the two middle ones. Row 4, the two on the right. Personally I'd prefer a slightly longer sleeve. @Sandra the fabric in Row 3 Number 2 is a border print panel with a deep black field taking about 18" before 18" of the floral. I love using the black portions of the panel to accentuate the splashes of color at the hem and the bust (the convex areas), and letting the black visually bring in the waist and belly a bit. But thank you for letting me know! I do appreciate the feedback. @Ratphooey thanks for the feedback! You'll be happy to know that this style has a cap sleeve, but other styles have a longer sleeve length - some turnback cuffs, some flutter sleeves, some a "mandarin wing" as it was referred to in a 1940's dressmaking book I have. All are designed for spring and summer, where any desire I have for covering my upper arms is trumped by my being SO HOT! But I am trying to make sure everyone is accomodated. Thanks for the feedback! Favorites: Row 2, columns 3 and 4 - the vertical stripe in the skirt bottom is a beautiful addition to the overall cut of the dress. 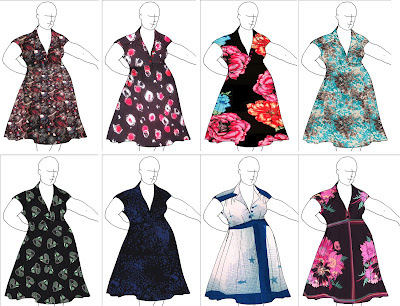 Row 3, column 2 - I love the shoulder and knee floral accent with the simple black torso. Elegant use of fabric. @Sofia thank you! The accent and color usage you're speaking of is a PANEL PRINT. It was used in the days of single screen printing, and often the size of a single scarf (24"x24" or 36"x45"). The plus to this method, as opposed to a rolling continuous print, is that you can get these large, differentiated border prints and huge scale images. The down side is that it was much more skilled labor intensive (pick up the screen, put it down exactly at the same registry points every time), and created potential waste at the screen overlap edges, thus difficulty in factory production cutting. It also explains why this type of fabric so intrigues me - it's a throwback AND it's rare!